We are advocates of the private label business model at Jungle Scout, where you find an existing product with enough opportunity and demand for you to enter the market. However, that doesn’t meant we don’t welcome and congratulate the creative product inventors out there. That’s why we reached out to Amazon product design and development expert, Filip Valica, to explain exactly how it’s done. Filip has helped many businesses develop and launch winning products, and has some unmissable insights to share! 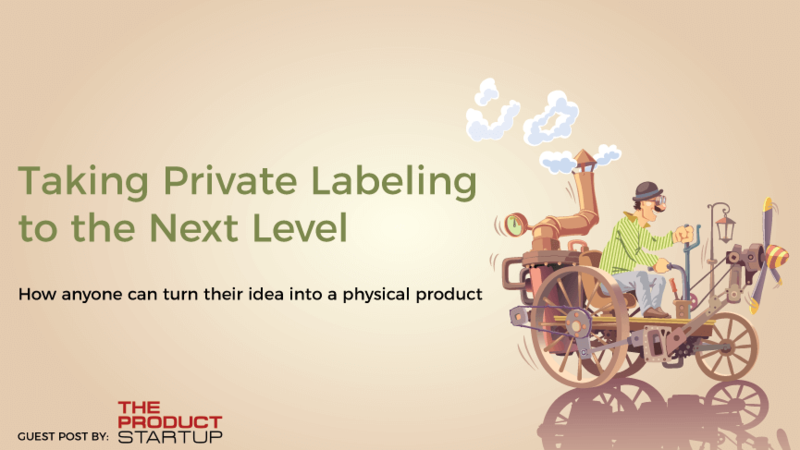 Are you at the point where you want to move beyond private labeling and create a custom product? Whether you are ready to do it yourself, or looking to hire some help, this post will outlines the steps it takes to develop a new product. A long time ago, a boss once told me, “If our business is not growing, it’s dying a slow death”. That parable is almost cliché. But as much as I’d like to disprove it, it still holds true. As Amazon sellers, we have seen costs continue to increase. The price of raw materials, manufacturing and shipping continue to go up every year. At the same time, competition on Amazon continues to tighten as new sellers and better tools enter the market. We are under constant pressure to differentiate our products and marketing. New opportunities exist in targeting underserved, niche markets. One way to continue pushing our private label businesses forward is to create a custom product, unique to the market. For a long time, developing a custom product was reserved for companies with the right talent and connections. Fortunately that’s not true anymore. Just as online sales have exploded, so have the tools and technologies that make DIY Product Development a real possibility. My first ecommerce sale (at the risk of sounding like a dinosaur) was selling a jewel-toned iMac on eBay through PayPal. Fast forward two decades. Payment gateways and ecommerce platforms keep getting easier to create listings and sell products. As sellers, we have almost too many choices. We can create listings faster and reach new customers cheaper, with each passing year. Product development has seen similar growth. We can now make prototypes at our desks that once required expensive machines reserved for universities and corporations. More importantly, the design software needed to create new designs has evolved so that it is simple enough for anyone to pick up and learn. And if we don’t want to buy tools, we can borrow them. The rise of MakerSpaces and Hackerspaces across the world means that we can access cutting-edge tools. They even provide the classes and training needed to make your own prototypes. Online brokers have improved our access to information in almost every area. We now have direct access to the people and tools to turn our ideas into products. Freelancer sites connect us to graphic designers that can help create logos and design packaging. The same sites host experienced product designers and drafters that can turn ideas into drawings. In the past, ThomasNet was the best option to find manufacturers. Now there are other places to find local prototyping and fabrication shops. Plus, Alibaba and Global Sources help us find manufacturers. Finally, quality assurance and freight is easier to quote and book online. So that’s the positives. Being a product inventor has never been so easy. But that doesn’t mean it comes without a significant input of time and effort. 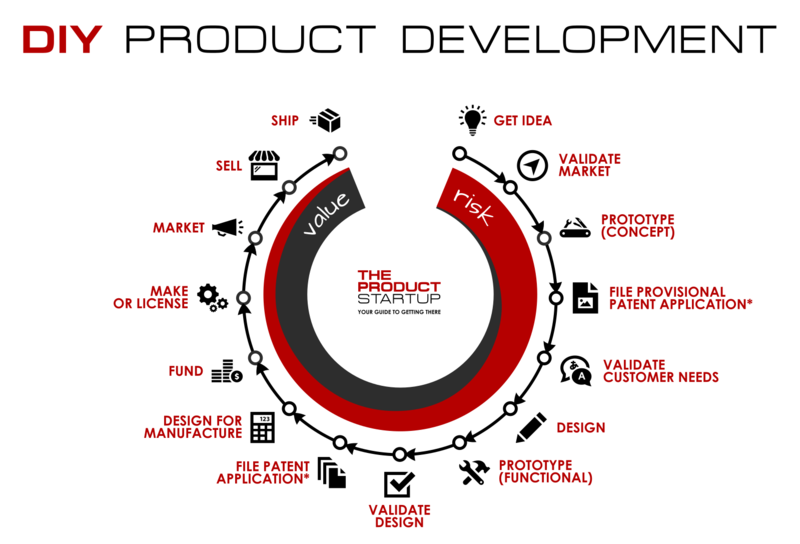 Let’s take a look at the steps involved in product development, from conception to sales. We all know the typical path to market for most products: design, build, and sell. But despite what it may look like, this process isn’t a straight line. It’s iterative. Bringing a product to life is a creative process with many variables, inputs, and outputs. Balancing customer needs and product features against product costs isn’t always clear at the start of the process. For the last 12 years, I have worked as an engineer for small mom and pop companies and large corporations. It was my job to turn ideas into physical products. Some companies employed teams that worked in parallel, while some developed custom systems and tools. After working in different industries, I learned that all successful products followed a similar path to market. I have outlined these steps in the process below. Each step was designed to reduce risk and increase confidence, while minimizing cost. No boss I ever worked for had enough money to throw at the wall to see what ideas stuck. I suggest sticking to the steps in this order. To help you out, I’ve highlighted some tips and common pitfalls to avoid. There are many brainstorming techniques to help train our creativity. I won’t get into them now, but we have a unique advantage as existing Amazon sellers. Every company I have worked for tapped into their existing customers for new product ideas. You may have a whole list of ideas that you’re looking to develop. That’s good. At this stage, the more ideas the better. Pitfall: Don’t try to gather and evaluate ideas at the same time. It’s all about quantity over quality on this step. Use keyword trend tools, niche research, industry news, and specialized trend publications to get an idea of where the market is going. Trade shows and fairs are also a great source. Keyword Scout & Niche Hunter are great tools to help identify potential niches and keywords. The issue with the above is that much of this “data” is a prediction. Many markets are prone to “group thinking” – duplicating what they hear elsewhere. As Amazon sellers, we understand the market well enough to know where trends may be going. We get feedback through emails, reviews and competitor sales to tell us what customers need. We just need to continue these conversations with customers and listen. Tip: Don’t ask leading questions like – “Wouldn’t it be great if you had a widget that did X?” It’s too early for that. Seek to understand the customers’ needs – the true pain we are alleviating, at their level. After getting a good idea of the customers’ needs we are trying to fulfill, we can create a mockup of how the final product may look. People tend to be visual communicators, especially when it comes to physical products. They like to touch and see items and have conversations around them. Create a prototype with what you have, as fast as you can. I prefer hacking together “Frankestein models” from existing products. The dollar store is perfect for this – you can’t buy the components and parts for cheaper anywhere else. Pitfall: Perfect is the enemy of the good. The focus here isn’t on a flawless model, but on getting something out there that you can get feedback on. Sometimes there is no “right” answer to this. First, consider that the USPTO (US Patents & Trademarks Office) is full of patents that sit idle because those products never launched. Also, if you look at store shelves, a majority of products aren’t patented. Is it possible to patent your feature, product design, or manufacturing process? Do you have the funds to defend it? 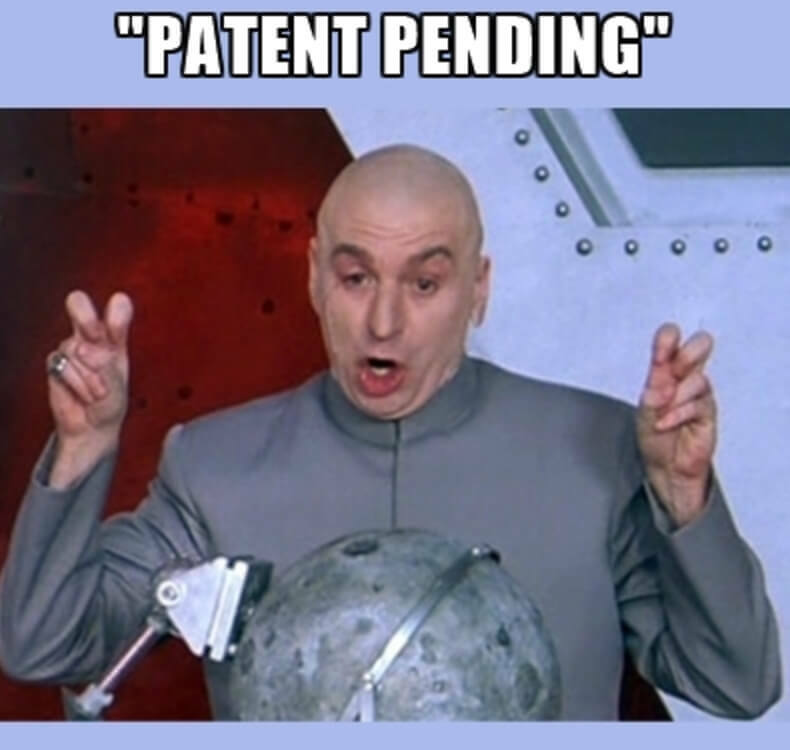 Consider filing a provisional patent application. This is much cheaper than the $7k+ for a lawyer to draft a full patent. You can do this yourself with the USPTO website, or hire a patent lawyer to help. This will give you 1 year to explore your idea further, allowing you to mark your product as “Patent Pending”. Then, if there is demand, let the market pay for the full patent. Tip: Bear in mind that changes to the design after the provisional application is filed require filing a new application. At some point we must show potential customers where we are going to make sure the product we are creating is still on track to solve their problem. Using your concept prototype, speak to 15 to 25 people in your market. If you have created a brand around your Amazon products, you may already have a list to reach out to. What would the ideal solution be? What hasn’t worked for them before? Pay attention to answers that will give you clues around the materials, size, color. Other than getting tangible feedback, the ultimate goal of this step is to get your audience to pre-order, or sign up to follow the progress of the product. This is similar to what happens on crowdfunding sites like Kickstarter. Get people invested! Some people have had success using landing pages with an “order now” button or call-to-action. In my experience, the cost to generate traffic is too high at this stage, when the concept is still young. It’s also difficult to get feedback – this method only gives us a “yes” or a “no” but without the reasoning. Try to speak to as many people in as much depth as possible. Tip: If you are more excited about the product than your target market, pause. There is either an issue with the product or with the audience. Test and iterate more before moving on. I always think that product founders need to compile this data on their own. If we don’t understand our clients’ needs on a deep level, we won’t be able to make educated decisions that impact our business later on. Create a model or drawing of your product using many of the free tools available online. Some architects and designers use Sketchup to create quick 3D models of projects. Another option is Autodesk 123D, but it’s being discontinued, so download it fast! TinkerCAD is a more simple, online-based software to help you make models for 3D printing quickly. For 2D drawings or blueprints, Draftsight is a perfect (and free) replacement for the tool professionals use: AutoCAD. Whatever you do, don’t run out and buy a 3D printer unless you plan on making more than a few prototypes and enjoy experimenting and troubleshooting prints. Instead, consider joining a local Hackerspace or Makerspace. You can also use services like Shapeways or Ponoko to create or upload a 3D model of your design and have it shipped to you. You can also reach out to contract product designers through freelancing sites. Another good source for help is local colleges. Senior engineering and industrial design students are often paired with local businesses for a final project. Pitfall: Many product designs don’t contain enough information. For example, the thickness of a part or the texture. Look to competitors for clues. Is it important for our product to be different? With the design in-hand, you can now create a functional prototype. Depending on the complexity, you can do this yourself or seek out specialized companies to do this for you. An excellent resource is 3D hubs, where you can find a local 3D printer to print scale models of the product. Many times, 3D hubs can create the design files as well. The first functional prototype should simply test a key feature of the product – it doesn’t need to be pretty. As you refine the prototype, it should iteratively shift towards what it should actually look like. Tip: Don’t try to prototype everything at once, especially on complicated products. Divide and conquer. Does the product (as designed) do what you set out to do? What do customers expect? For example, will it absorb a drop from table? Does the coating scratch off easily? How does your target market respond to your functional prototype? Have them use it with minimal promoting and directions and take great interest in any issues that come up. At this point in the process we are eager to get rolling with production. The final design step is to make sure that our product can be produced at a high quality at our target cost. The design files (specifications, drawings or models) should have all the details, such as a surface finish and manufacturing tolerances. Your manufacturer can help you with this step. In my experience, if you are not paying the manufacturer for the design, they may try and keep the files. This makes it more difficult to show it to other manufacturers and shop around. Watch out for this. If working with manufacturers in China, this may also be a good time to draft a non-use, non-disclosure, and non-circumvention (NNN) agreement to protect your idea. Depending on the complexity of your product, you may want to create manufacturing prototypes. This will confirm that the factory can work to your standards. Note that the cost of these can sometimes be as much as 10x the final unit cost, depending on the processes involved. Tip: Consult manufacturers during the design phase. Manufacturer capabilities will vary and each may want to tweak the design to fit their production equipment. The rise of crowdfunding and micro lending has helped many creators launch their products. Success here depends a lot on how many customers we attract during the early stages of development. Crowdfunding platforms want to see a large chunk of the project funded during the first week. Otherwise, the product will get buried on the second page of the website. Amazon sellers are in a good position for existing businesses to self fund product development. This minimizes the risk of the product failing to launch due to no raised funds. Tip: Depending on lead times, you need to make sure that you have enough cash on hand to kick off production. Many times you will need to place a second order with the manufacturer before the first order has sold. This step is usually no different than producing a private labeled product. One exception: Custom products usually have one time setup or “tooling” costs. Talk to your manufacturers about the startup costs and what will happen to any molds or templates that you pay for. Can they ensure that other customers won’t get access to your molds and jigs? Tip: If you private label, then chances are that you already use a quality inspection service. This is particularly important with custom products that have more kinks to iron out. By now you’ve spoken to your target market. Perhaps you even have many segments with unique demographics and interests. It should now be easy to create the top selling points of the product. What are the features and how do they translate to the benefits? Take away: When the marketing focuses on specifications it can lose the sale. Customers are buying solutions, not products. I ask clients to first sell online, and then move into local boutique stores, and finally to big box stores. As Amazon sellers, we are already familiar with this step. In addition to creating an Amazon listing, this is also a good time to throw up an ecommerce site. The traffic and conversion rates sellers get on Amazon is many times what we can get from our own ecommerce stores. But it’s important to have a home base to capture leads and direct wholesale buyers. Take away: Sometimes people want to jump to big box sales first. Not only is it difficult to sell big box buyers without proven sales, it’s also much riskier. It’s easier to fix design and manufacturing errors early with smaller sales online. I know that this article may seem daunting or overwhelming. I agree that it’s not easy to launch a product from scratch. But many of the problems are known – the solutions are out there. One of the reasons I broke down this process into so many steps is to make it easy to anyone follow. The most difficult aspect is to stay focused and on track. Remember that the process is iterative and don’t get discouraged if you have to take a step back to move forward – that’s normal. So roll up those sleeves and get started. There is no yesterday or tomorrow. Only now. Take one step to move you towards creating a product and business. Then take another. 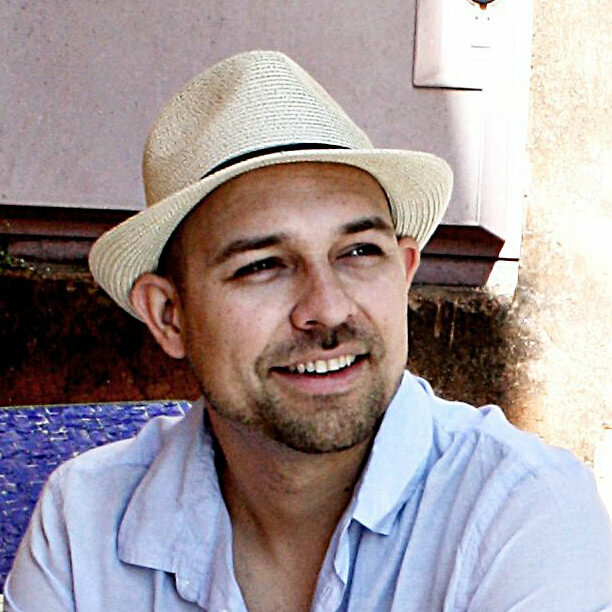 Filip Valica is the founder of The Product Startup and helps small businesses and entrepreneurs bring their ideas to market. On his podcast, Filip interviews successful small business owners, inventors and Shark Tank winners to explore the intersection of DIY and Product Development. Can you change the smartwatch design and keep the internal as it is and sell it as OEM?